OK, let’s go ahead and start here. This is a 30-minute case for Tom Brady. And right there, we’re already being a little misleading. Here’s what I mean by that. This case for Tom Brady isn’t going to take 30 minutes to read. No, hopefully it’ll just take 30 minutes to write. Because honestly, I could think of a lot more productive things to do with my time. It’s also misleading because the 30-minute case for Tom Brady isn’t really even a case for Tom Brady at all. Here’s the deal… The 30-minute case for Tom Brady is really about two things. Tom Brady may be a better all-time quarterback than Peyton Manning. Then again, Peyton Manning may be a better quarterback than Tom Brady. It’s an auxiliary verb. The kids may* remember it being called a helping verb** in elementary school. In the simplest terms, it’s used to express possibility. I may be wrong. This may end up taking longer than 30 minutes. You get the point. So yes, Peyton Manning may be better than Tom Brady. He may be the best quarterback of all-time. That certainly seems to be a hot topic this week. After all, it is Super Bowl week. And Peyton Manning and the Indianapolis Colts are in the Super Bowl for the second time in four years. They play the New Orleans Saints on Sunday, and a lot of very smart people seem to think that Peyton Manning can cement his place as the best quarterback of all-time with another Super Bowl title. And yes, this may be true. By any statistical measure, Peyton Manning belongs in the stratosphere of NFL quarterbacks. But here’s something that is a little disconcerting. The Peyton Manning story — the narrative that this is “his moment”, this is the week that he becomes the best of all-time — seems to have taken over the Super Bowl. Why is this troubling? Well, for one, Drew Brees and The Saints could very easily throw a bucket of water on the story on Sunday. And secondly, I’ve heard very little discussion on “why” Manning is better than Brady or Montana or Elway or all the rest? Oh yes, we hear the same talking points*. *Peyton is the smartest quarterback in football. He’s a guy that makes his teammates better. He watches hours and hours and hours of film, and wow, what a player. He’s the best ever. It’s not even close. Of course, sometimes people begin to shout these things really loud. And if enough people shout the same thing, then many people begin to regard it as fact. You know the term group-think? I guess it’s something like that. And yes, Manning is a phenomenal quarterback. But it’s not exactly clear-cut. And these talking points, these facts people keep bringing up… well, sometimes they’re not even really accurate. For instance, there seems to be some revisionist history going on about Manning and Brady. If you’re listening, you might have heard somebody argue that Brady has been surrounded by playmakers in New England all these years. And, oh yea, he had Belichick and that defense. Manning never had that, they say. And you might hear somebody argue that Manning has been throwing to bums all these years. And that he won a Super Bowl with lesser players –- and an average defense*. *More on this point in a minute. But Dwight Freeney, Bob Sanders and Robert Mathis say hello. – In eight full seasons, Tom Brady has 225 touchdown passes and 99 interceptions. He’s thrown for 30,844 yards and has a passer rating of 93.3. – He set the NFL record for touchdowns in a season with 50 in 2007. – He has three Super Bowl titles. He has won two Super Bowl MVP’s. He is 14-4 in the postseason. And he is 97-30 in the regular season. – In the 2002 Super Bowl against the St. Louis Rams, he was 16-27 for 145 yards and 1 touchdown. – In the 2004 Super Bowl against the Carolina Panthers, he was 32*-48 for 354 yards with 3 touchdowns and 1 interception. – In the 2005 Super Bowl against the Philadelphia Eagles, he was 23-33 for 236 yards and 2 touchdowns. – In the 2008 Super Bowl against the New York Giants, he was 28-49 for 266 yards and 1 touchdown. 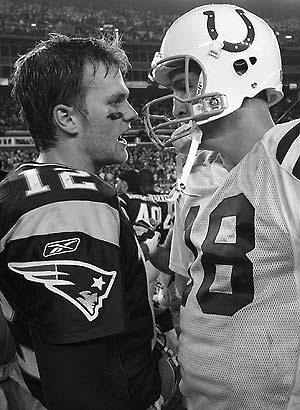 – Tom Brady is 7-4 against Peyton Manning. *The most completions in Super Bowl history. Now let’s move on to Peyton. In his best season, he threw for 49 touchdown passes. – He has won one Super Bowl title. He has won one Super Bowl MVP. He is 9-8 in the postseason. And he is 117-59 in the regular season. – In the 2007 Super Bowl against the Chicago Bears, he was 35-48 for 247 yards with one touchdown and one interception. – Peyton Manning is 4-7 against Tom Brady. OK. Let’s do a quick recap. Tom Brady has played four fewer seasons. He has the edge in Super Bowl titles. He has the edge in head-to-head record. Manning, of course, has the better overall statistics, but again, Manning has also played four more seasons. Now you might bring up the fact that Manning has done more with less. Oh yes, the “Brady had a better team around him” argument. So here’s the question: Has Manning really done more with less? To answer this question, we’re going to get a little help from ColdHardFacts.com. * offensive tackle (Tarik Glenn). That’s six of 11 offensive starters who are No. 1 draft picks. At least one, Harrison, is a lock for the Hall of Fame. James is a potential Hall of Famer. Manning had the luxury his first year in the league of handing the ball to future Hall of Fame running back Marshall Faulk, one of the most prolific offensive players in NFL history. Manning has also enjoyed the luxury of offensive Pro Bowlers ever year that he’s been in the league: Faulk (1998); James (1999, 2000, 2004); and Harrison (1999-2004). In other words, the Colts have purposely built a team that gives its quarterback a chance to pad the stat book. * Mike Vrabel (a journeyman NFL linebacker). New England’s offensive line in 2004 featured a second-round draft pick (Matt Light), two fifth rounders (Dan Koppen and Russ Hochstein), a seventh-round pick (Brandon Gorin) and three undrafted free agents (Stephen Neal, Joe Andruzzi and Tom Ashworth). In 2005, New England’s offensive line will finally future a first-round draft pick, guard Logan Mankins, who’s likely to fill the starting spot left by Andruzzi. So our 30 minutes is nearly over. Perhaps Manning will win this Sunday. I do have a sneaking suspicion that the Saints are going to do something special. And maybe Manning is the best quarterback ever. But I think it’s debatable. Very debatable. And that’s the whole point. Although, I do think Tom Brady has a very good case.